The football club AS Roma was founded from a merger of three smaller Roman clubs: Fortitudo-Pro Roma SGS, Roman FC and SS Alba-Audace. Out of all major Roman football clubs, only Lazio refused to be a part of the new project; this proved to be the beginning of one of the fiercest inter-city rivalries in the world, the famous "Derby della Capitale." 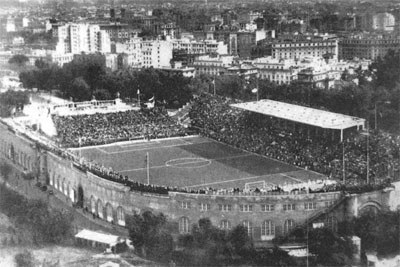 Stadio Nazionale del PNF in the 1930s. AS Roma was founded in 1927 and managed to make their mark on Italian football relatively early, by reaching many high positions in the top league until winning their first Scudetto in 1942. The post-war period saw them fall off the map a bit, as the club consistently found itself in the bottom half of the league. As a culmination of their troubles, the club was relegated in 1951; however, they managed to return to the first division the following year and remain there until today. The 60s saw A.S Roma enjoy some cup success, winning the Inter-Cities Fairs Cup in 1961 and two Coppa Italia titles (1964, 1969). This was followed by a major barren spell in the 70s, however, which lasted all until 1980. Under the leadership of manager Nils Liedholm, the club turned a new leaf and again entered the top echelon of Italian football. After they lost the title race in a controversial manner (regarding a disallowed goal, "gol di Turone") to Juventus in 1981, the club finally won their second Scudetto in 1983. They would go on to win four more Coppa Italia trophies before eventually declining to mediocrity in the latter half of the 80s and the entirety of the 90s. 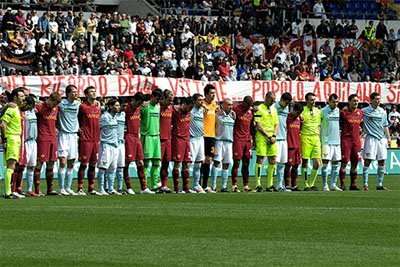 The rivals Roma and Lazio in a gesture of friendlyness. In 2001, Roma shocked the football world by winning its third Scudetto over the favored Juventus. While Roma had a strong team at the time, this title was mostly the work of one man: Francesco Totti, the King of Rome. Totti would spend his entire career in Roma, breaking many of the club's records along the way, including that of a top goalscorer. After the events of Calciopoli, Roma would prove to be the only true rival to the seemingly unstoppable Inter. Yet, they only managed to win two more Coppa Italia trophies during that time, while finishing runners-up in Serie A for the better part of the decade. 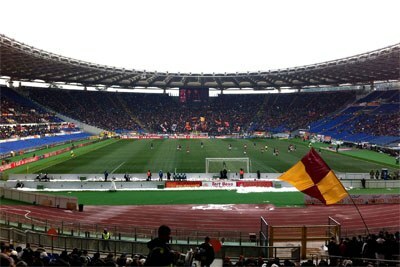 Roma playing at the Stadio Olimpico in 2011-12 season. Despite being a respected team in nternational top football, AS Roma is still waiting for winning one of the three major European Cups (the victory in the Inter-Cities Fairs, that was kind of predecessor to the UEFA Cup, may on the other side count). They were very close in the European Cup 1983-1984 losing in the final against Liverpool on penalties. The Roma logo pictures a wolf and two human creatures in the upper part of the shield. This is a Roman mythic motive and the two creatures is Romulus and Remus that was abandon by their mother and adopted by a she-wolf. Romulus and Remus are according to Roman mythology the founders of the city of Rome. In the lower part of the shield, "Roma" and the year of inauguration "1927" are written. In previous logos, the initials "ACR" could be seen at this place. 2010-11 Round of 16 Eliminated by Shakhtar D.